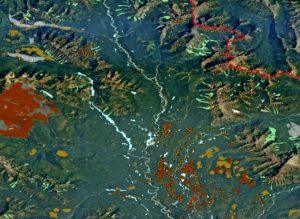 In Spring avalanche chutes are seen in green, cut blocks shown in brown and tan, fire in grey and riparian areas in blue. Bears usually emerge from hibernation between the beginning of April and mid-May; males emerge first and females with cubs last. When they first emerge they have much of the ground is still covered in snow so many plants have not begun their growing season yet. While denning bear digest up to a third of their muscle to maintain key organs like the heart. Additionally, they have consumed most of their body fat although females, especially those with cubs, typically emerge from the den with much lower body fat than males. Restoring muscle mass is a strong innate drive at this time so bears select foods that are high in protein. During this period the bears’ diet mainly consists of ungulates that they kill or scavenge, newly emerging plants like grasses and horsetail, and some roots that they may have to dig through patchy snow to find. 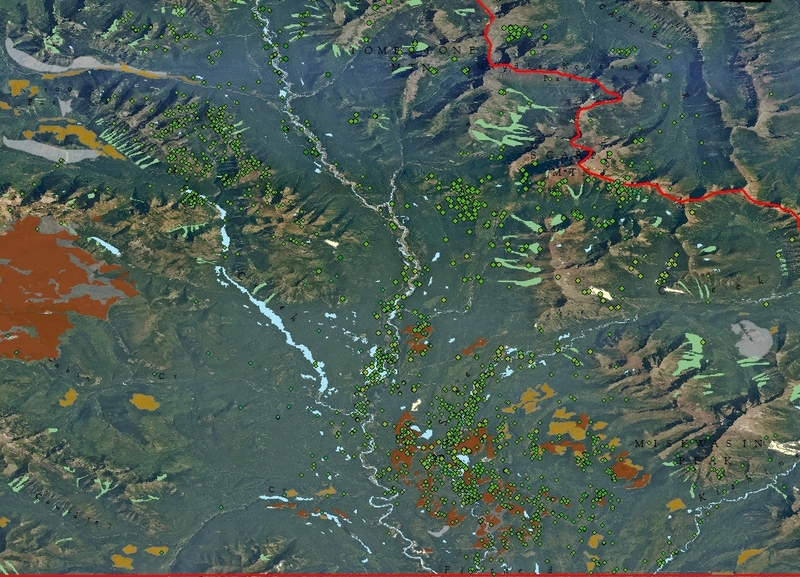 As the snow melts grasses become more abundant which are the bright green portion shown on the map (graminoids). Late spring is the season between green up of vegetation and when berries become ripe. In this season the largest component of bears diet are forbs (flowering plants which are not grasses) followed by grasses and horsetails. New-born ungulates are also consumed, more commonly by males. The major forb in the study area is cow parsnip that grows in abundance in both riparian areas and avalanche chutes. Other prominent forbs such as peavine and Sitka valerian are found in clearcuts, snow chutes and riparian areas. Horsetails and grasses, are found in cut-blocks and riparian areas. 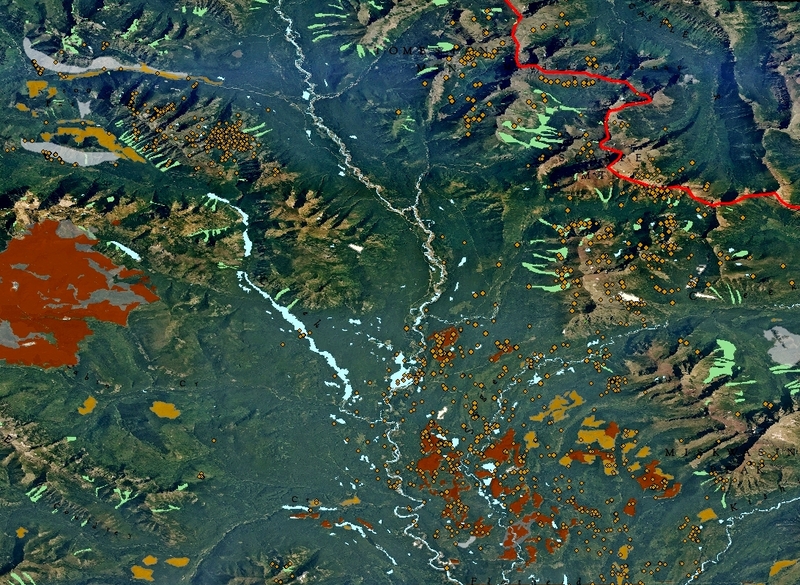 Along with the habitats found in spring early summer sees the addition of buffaloberry seen on the map in red. By mid summer most bears have rebuilt their muscles and their food cravings switch to high energy foods. Most years, buffaloberries ripen in mid-July and become the largest part of the bears’ diet and provide the bears with a food high in sugar. Forbs may also remain a large part of the bears’ diet. The bears convert sugars to fat that they will store to get them through winter hibernation. 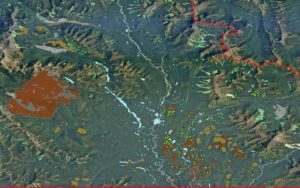 Along with buffaloberry patches (seen in red on the map) we also see the bears in clearcuts, snow chutes and riparian areas eating forbs and graminoids. 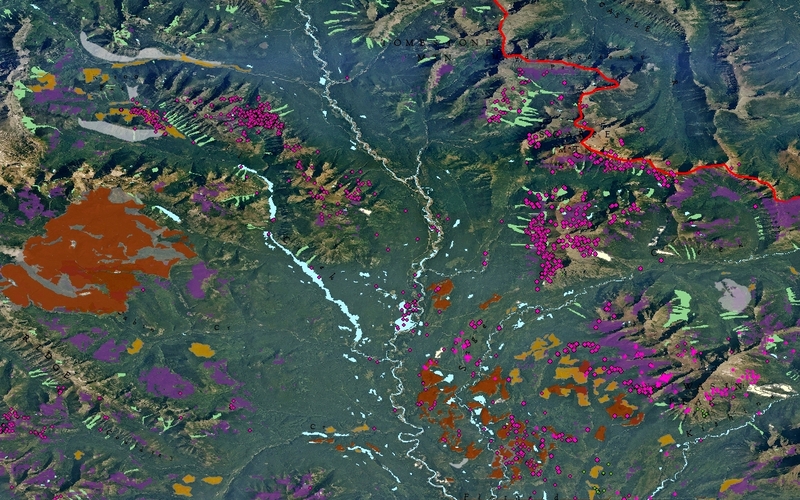 By late summer bears have moved on to huckleberries which are shown on the map in purple. By early August huckleberries begin to ripen. 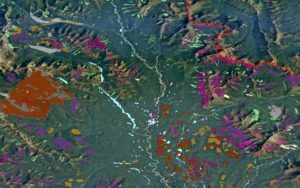 These berries are an extremely important food to bears and this is reflected in the volume they take up within the bears diet (huckleberry patches are shown in purple here). As with buffaloberries in early summer, managing to consume enough huckleberries is crucial to bears building enough fat deposits for the winter hibernation. 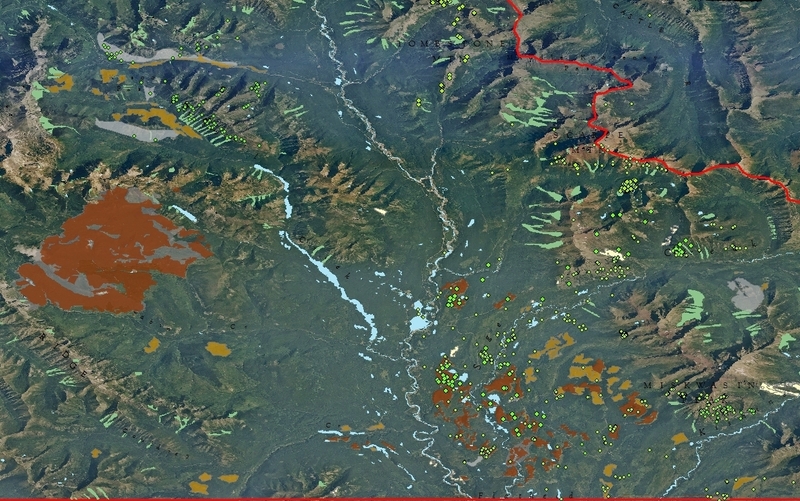 During this time we see that bears are in huckleberry patches and open forest, along with spending smaller amounts of time in clearcuts (shown in brown) eating ants and perhaps buffaloberries, snow chutes which contain huckleberries in this ecosystem along with some use of riparian areas where they are probably eating forbs. While some huckleberries remain until late September or even mid-October some years, the decrease in fruit in the diet is reflected by the decrease in its availability. As fruits and forbs decrease in the diet, roots and ungulates become a larger component. 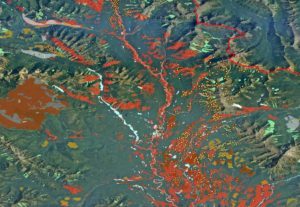 Bears search broadly for gut piles from hunter kills while roots are found in logged areas, along river flood plains and open forest. 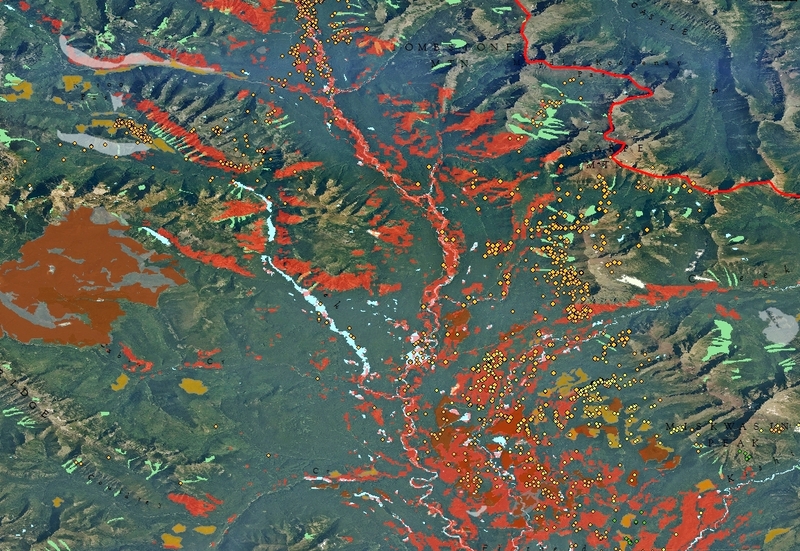 Bears are in clearcut areas (brown) where they dig for roots. 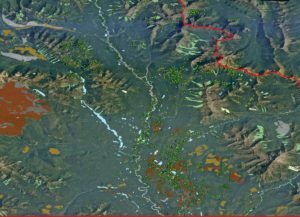 Riparian areas (shown in blue) are still being used and provide some forbs along with graminoids which can also be found in avalanche chutes (green areas). Ungulate kills by hunters cannot be mapped as one distinct habitat and so this may explain the more widely distributed points which do not fall into one of our mapped habitats. By late October and Early November the bears begin to look for densites at high elevation. Follow one of our bears Mammie and find out where she spent her time and what she got up to.